Inder Loves Folk Art: Plantain, meet Mabel. Why, hello, readers. How are you doing? I admit, KCW and Shorts on the Line kicked my behind, and I sent most of the last week recovering (and, you know, catching up at home and at work). When I finally came out of recovery mode, I couldn't face the unfinished KCW projects that piled up last week. After all of that kid-sewing, I wanted to sew something fast, fun, and for me. We are getting ready to go on an epic train journey to the Pacific Northwest to visit friends and family, so I am wanting some easy pieces for traveling with kids during a heat wave. Knits, knits, knits, right? 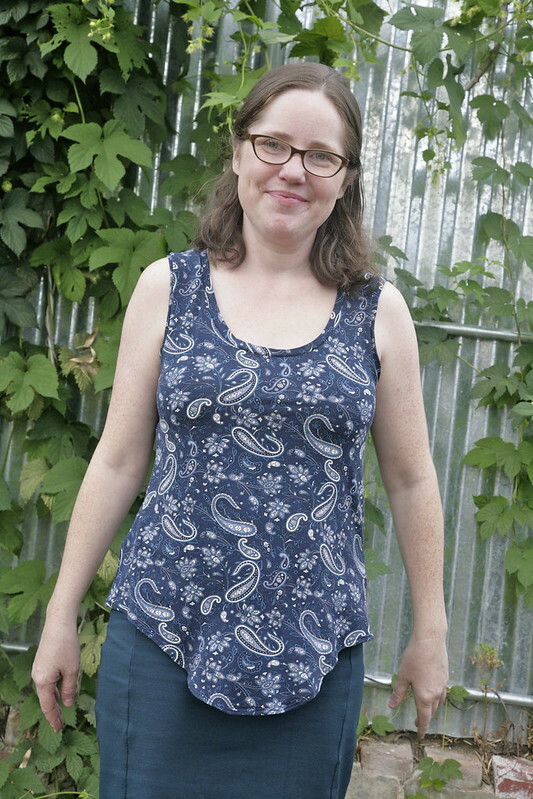 I have wanted to try a sleeveless version of the Plantain T-Shirt ever since the weather warmed up, so I went ahead and used up the rest of the really-truly-lovely paisley knit I used for my first Briar Top (I still wear that shirt more often than any of my other Briar tops, and the fabric is holding up wonderfully; I bought it at Britex and it was probably really expensive but in this case worth it). 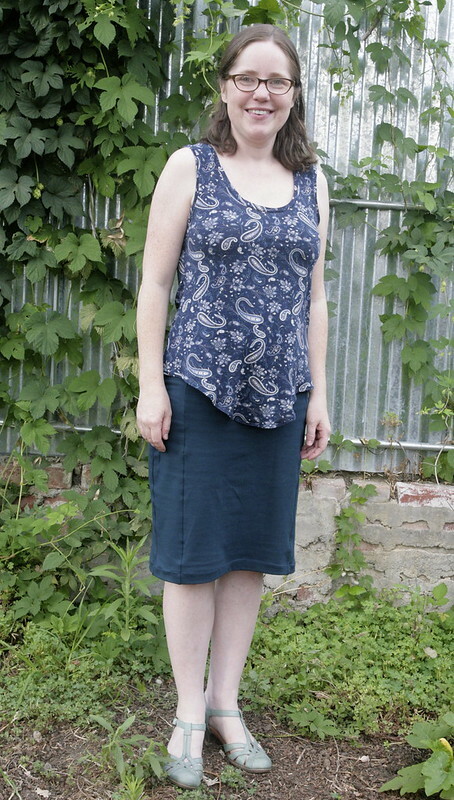 I wanted to do something different with the hem, so I added "shirttail" curves along the front and back of the hem. I used a RTW tank top to figure out how much to cut out the back neck and armholes, and then I bound the armholes just like the neckline. I was so pleased that the final result shows just the right amount of skin - enough, but not too much. And this fabric has the perfect drape for the flowy Plantain shirt; very flattering. This is what my face looks like when I get tired of smiling for the camera! You know, posing for blog photos gives me a newfound respect for fashion models. Who knew it was so hard to pose for a camera? Don't worry, I have no plans to quit my day job. The skirt is the Colette Mabel Skirt, Version 3 (longer, with front panels and a kick pleat) made up in the same teal knit ponte I used for Joe's Sketchbook Shorts. 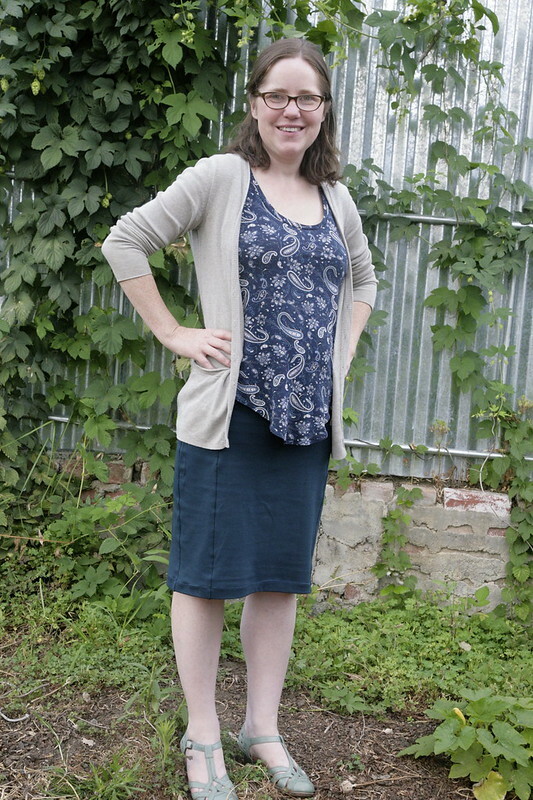 I managed to get this skirt and the shorts out of a yard and a half of this knit, and all I had left were a couple of scraps! I love using up every bit of a piece of fabric - especially here, as I have no idea what I would do with scraps of ponte, but I would probably feel obligated to keep them anyway. So ... brace yourself ... I sewed this up in a size Medium, and made no changes whatsoever. I tried it on before I sewed the waistband on, and it fit perfectly. That never happens. Gotta love knits - so forgiving. I love the length, and the kick pleat. The fabric is sturdy enough not to show your underthings, but as comfortable as sweatpants. Perfect for travelling. And it was so easy to make with a serger (but completely doable without one too). I'm stoked! I want another one, in black, and maybe mustard yellow, or maroon? All. The. Colors. Seriously. Most practical garment ever. Steve told me to shake my booty. Here you go. You're welcome. And because no photo shoot would be complete without the "styled-with-a-cardigan" shot, here's the outfit with a cardy, which I'm sure I'll be wearing as much in the PNW as I do here in Oakland. If you don't hear from me for a couple weeks, never fear! I will be back in mid-August to bore you to tears with photos from our trip! oh I love the mabel! it looks very polished but casual enough for mommy-wear. looks great on you too! The outfit is great, Inder! Stylish and comfortable...can't beat that. Have fun on your trip! Looks great! These are two of my favorite patterns. I may have made Mabel v3 out of teal ponte too. This outfit is fantastic! 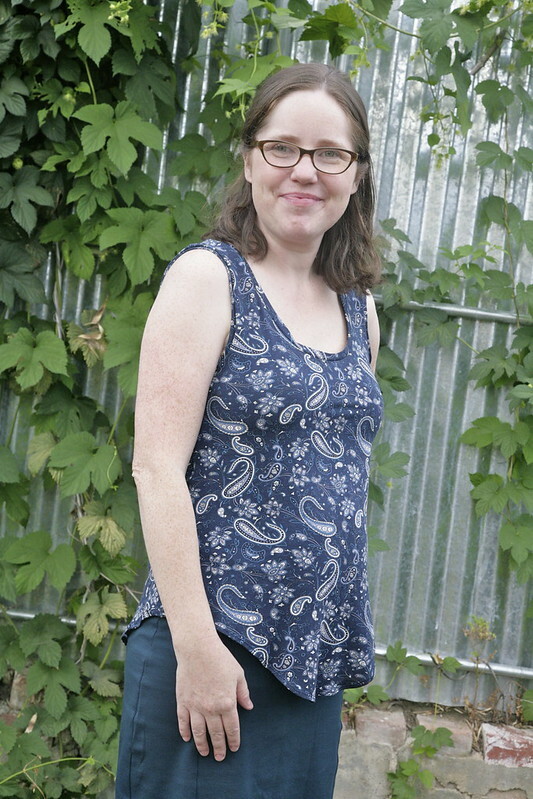 That fabric you used for the tank-- I love it so much! And your details on the skirt look perfect. It looks better than store bought. I am not sure if my hips can handle the Mabel but I keep seeing them and I may give it a try yet. Ooh, love both those makes, but am possibly more excited about your hops! Since we went to New Zealand where they have some brilliantly delicious hoppy beers, we have got back into home brewing and have used some dried hops and hops pellets - Galaxy and Motueka. First brew astonishingly good, second still in progress but smelling very promising. It would be so fabulous to use your own hops. My brother tried to grow some for a while but I think our climate is a bit hot here. I look forward to reading of your progress! Wow, Inder, there’s so much to say about this post! First, I’m so impressed that you modified the sleeveless version so seamlessly (no pun intended) har har It really does look fabulous on you. So funny about getting tired of smiling and sympathizing with fashion models. :) I am so impressed that you would consider making beer with your own hops. We have a beer making kit, but the thought of growing my own hops did not even occur to me. And as always, you are rocking the cardigan! Oh wow, you look stunning! That outfit is drop dead gorgeous, just make half a dozen in different colour ways. Great hemline on your plantain Inder - I find the shirttail hemline flattering. And have a great time on your trip. Looking forward to your pics - I love seeing people's travel photos. That is such a comfortable and nice looking outfit! Well done! I hope that you're having a lovely vacation- look forward to reading about your trip.